I have a soft spot for many animals but the Canadian Goose doesn't make the cut as far as I am concerned. As I've written before they are nasty aggressive bullies, who if left unchecked, can make their surroundings unlivable for anyone who would rather not step in or inhale goose waste. I will grudgingly admit though that one of their saving graces is an ability to stand up to most other creatures in defense of their nests, mates, eggs or young. In Oklahoma, at the U.S. Army Base Fort Sill, a goose named Steve apparently thought that some soldiers were getting a little too close to his nest. And Steve shared his displeasure with the soldiers. I guess he showed them. A security camera at Oklahoma's Fort Sill captured the moment a group of soldiers found themselves under attack from a territorial goose. Personnel at the U.S. Army post said a pair of geese nicknamed Steve and Brenda have been living outside a building at the facility for some time. 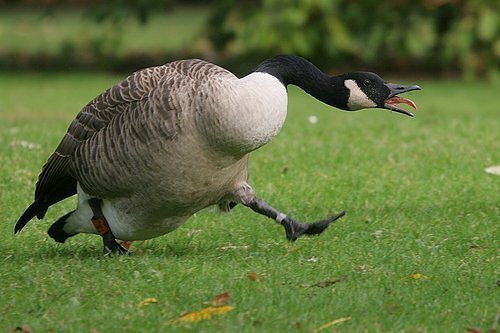 The security camera shows the goose known as Steve blocking the path of some soldiers and flapping at them aggressively, causing them to flee. "A family of geese that we named Steve and Brenda frequent our building here," the uploader wrote. "Steve has been very protective lately of the nest and attacked a group of soldiers. Soldiers, being the tough guys, got totally punked." The uploader said the soldiers didn't retaliate against Steve. "The goose was not harmed. We actually take good care of them and give them food and extra hay for their nest," they wrote.